​Sixteen Austin-area elementary schools will participate in a study with University of Texas at Austin researchers thanks to a $3.85 million grant from the National Institutes of Health to learn whether growing fruits and vegetables and learning nutrition and cooking skills can improve health and reduce childhood obesity. The project — a first-of-its-kind controlled experiment in four area school districts — is breaking ground on its first school gardens in Central Texas this spring. ​Jaimie Davis, an associate professor in the Department of Nutritional Sciences, is calling the program TX Sprouts. The intervention will introduce school gardens and nutrition and cooking classes for third-, fourth- and fifth-grade students in schools where children are at higher than average risk for being overweight and obese. The first garden of herb beds, vegetable beds, several native beds and an outdoor teaching area will be built at Oak Meadows Elementary in Manor on March 5. Davis and her team hope to expand on promising effects seen in an earlier pilot study Davis led at four schools in Los Angeles. 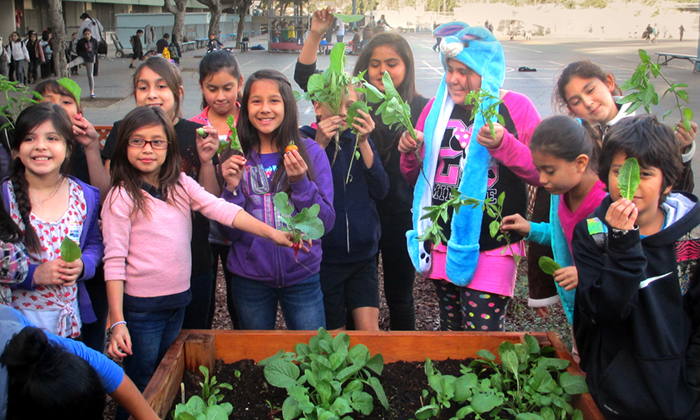 Los Angeles students received 90-minute classes in nutrition, cooking and gardening once a week after school for 12 weeks. 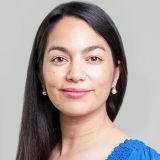 According to a paper by Davis and colleagues published online this month in the journal Pediatric Obesity, the pilot program was effective in improving dietary intake and reducing obesity and metabolic risk in Hispanic youths. "We saw that teaching kids to grow their own food, doing a seed-to-plate approach, was very impactful," Davis said. "I hope to see the same effects of reducing obesity and increasing dietary intake on a larger scale with TX Sprouts." In the Central Texas study, Davis and her team will test the effects of students participating in the TX Sprouts intervention on childhood obesity parameters, metabolic disease risk, dietary intake, diet-related behaviors and school performance compared with students at control schools, who will not receive the intervention until after the study has been completed. Each school will be provided with more than gardens; families, teachers and students will receive training to help the schools sustain the program. Garden leadership coalitions of parents, teachers and students will be formed at each of the schools and receive resources and training for two years. Davis says it is important to involve parents in the program, so she will hold a series of parent classes that will include a cooking activity and meal for the family, as well as on-site babysitting for younger siblings. "Parents are responsible for a lot of the food preparation and grocery store shopping," she said. "A family intervention, we know, will be more successful than just a child intervention." After the first year, schools are provided with a series of training workshops and resources to sustain the program on their own. Researchers will measure the strategies schools use to keep the programs going in hopes that their findings could provide a successful, sustainable model for future garden-based programs aimed at decreasing obesity and metabolic disease in high-risk populations. Vivian Abagiu is the Digital Content Producer for the College of Natural Sciences. She holds a master's in journalism from the University of Missouri and a bachelor's degree in communications from St. Mary's University.